I successfully made Italian Meringue Buttercream!!! This experience reinforced, in my mind, that cliché saying "If at first you don't succeed, try, try again." I gave myself a couple weeks to sit back and try to figure out where I went wrong, and then I was right back at it, this time with a successful outcome. As for the differences between Italian and Swiss Meringue Buttercreams, it's all about the method. For taste, I think my new favorite is Italian. Swiss feels too buttery and dense to me, and Italian is nice and light. 2. Add 1/2 c water. DO NOT STIR! If you must move things around, you need to swirl the syrup, not stir. 3. Wait for the syrup to reach about 230-235 degrees F, then begin whipping egg whites in an electric mixer. Once the egg whites are frothy, add remaining 1/4 c sugar. Continue to beat until very stiff peaks form. If you can hold the bowl over your head and none of the egg whites fall out, you're good to go. 4. At the same time, be keeping a VERY CLOSE EYE on the syrup. The syrup should be done cooking around the same time the egg whites are done whipping. Once the syrup hits the 245-250 degree F mark (the "firm ball" stage), remove the saucepan from the stove. 5. This is the scary part- with the mixer turned on medium, pour a SLOW and STEADY stream of the syrup into the mixing bowl. Be very careful not to get the syrup on your hands, because it really hurts (trust me on this one). 6. 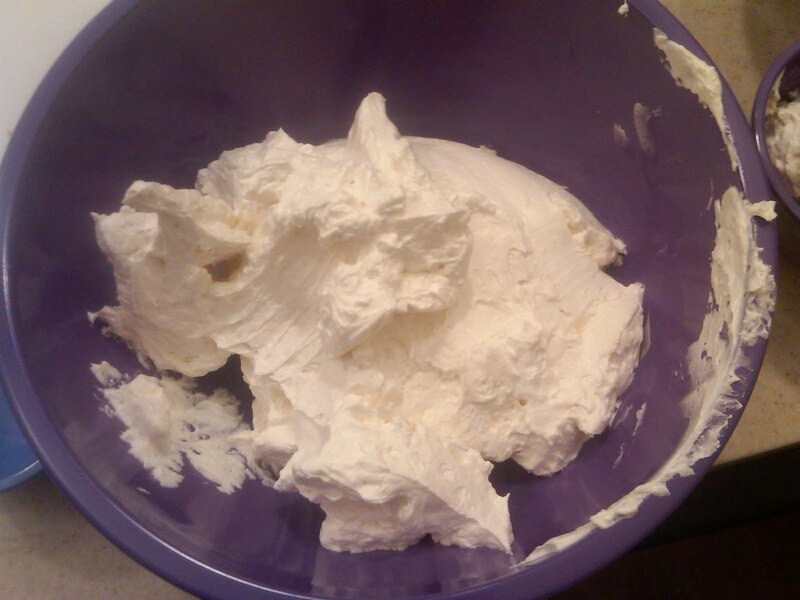 Whip the egg whites/syrup mixture on high until the bottom of the mixer bowl is cool to the touch. The mixture at this point should have the texture of marshmallow fluff (yum!). 7. Now it's time to add the butter. Reduce the mixer speed to medium, and add one cube of butter at a time, making sure each cube becomes fully incorporated before adding the next (I slowly counted to 10 in between each cube). Don't forget to scrape down the bowl from time to time! 8. After all the butter has been added, turn the speed back up to high. Sit back and watch as your IMBC goes through the various stages (soupy, thicker, curdly, final). Once it's thick and luxurious, add vanilla. YOU HAVE COMPLETED THE STEPS! Congratulations! Kaitlin at Whisk Kid has great troubleshooting advice. If your IMBC won't get out of the soupy stage, as mine did, try sticking it in the fridge for 10 minutes, then continue whipping.